Tessa Knapp, 6, looks on as her aunt, Lauren Ticak, and grandma, Eileen Sebold, all of Bay Village, disassemble a bike chain with the guidance of Pat McGannon. 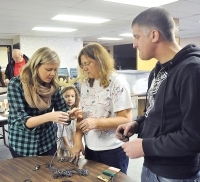 The spare parts were used to make candle holders, ornaments and jewelry at the Village Bicycle Cooperative on Dec. 8. Thanks to all the people who stopped by the Village Bicycle Cooperative on Dec. 8 to make bracelets, votive candle holders and star ornaments from unusable bike parts. It was a great way to socialize and utilize the bike parts that have been donated by generous people. If you are interested in learning more about bicycle maintenance and repair, a great way to do so is by starting on children's bicycles. Under the skilled help of the VBC technicians, you will learn quickly. It is also a great way to give back during the holiday season because the refurbished bicycles will be donated to the Salvation Army and St. Raphael’s Church to be given to needy children. Village Bicycle Cooperative has donated 21 bikes in the last three weeks to charitable organizations. Volunteer hours are Wednesdays from 6-8 p.m. at VBC, located on the ground floor of the Bay Community House at 303 Cahoon Road. The website is www.villagebicycle.org. Upcoming events are being planned for 2014 and we could use people skilled in communication and business to help organize these events. Further information on this will be coming. Thanks to all who have volunteered this year. We want to wish all of you a wondrous, adventuresome and peaceful holiday and wishes for many miles of open road and clear skies in 2014.